You are here: Home / Helpful Articles / How Much does Michigan Lighting Design Cost? How much does Michigan lighting design cost? There are only a hand-full of reputable wedding lighting companies in Michigan. It is important to know what really makes the difference in price. Not every company is the same, so read our tips below to find out the most common cost drivers for prices. In order to transform your room with lighting, your vendor has to know what you want to accomplish. There are different fixtures that are used to accomplish different results. 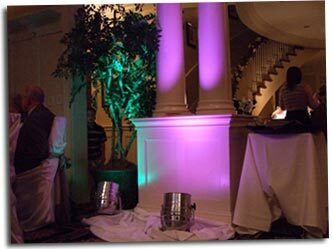 If you are considering uplighting, expect to pay around $40 per fixture. Since the setup is very labor intensive, it is common for lighting designers to have minimum requirements for lighting rental. They should also be able to show you photo/video examples of what your package should look like. If you are looking to cover a wall with pipe and drape, then expect to pay approximately $10 per foot. This cost also breaks down based on the desired height. What to make your centerpieces look larger than life? Having fixtures aimed onto your tables leaves a big impression for a reasonable price. You can expect to pay in the neighborhood of $10 per table to make your room light up. Custom image projection varies in price depending if you want a generic or custom design. Since there are other factors involved (example glass gobos), it is best to contact the lighting company to request quotes on custom image projection. It usually is between $75 and $275 per pattern. This makes up the quote in 2 ways and the first cost is time of lighting rental. Many lighting designers charge a technician fee to operate the lighting during your rental. This usually averages around $40 per hour. Especially since the lighting design is computer controlled, they will be able to change the colors as your evening progresses. The second cost associated with time depends on the amount required for setup. If your setup is longer, then that is because your package requires more equipment. This means more money. Most companies won’t charge you for setup or tear down, since this cost is already bundled into your package. If the company you hire has to travel more than 2hours, they might require hotel accommodations and travel fees. The travel fees will rely on the package you reserved for the event. Larger packages require cargo van(s) to transport the equipment. This will make the price of travel vary between $75-$200+. Those are the basic fees that you can expect to pay for the typical lighting design package. However, this article does not cover the advanced options available to clients. These add-ons have unique prices and really depend on what you want to accomplish. Because of this, you can expect to pay anywhere from $1,000 – $3,000 for lighting design. It is important that they understand what you need, so they can make suggestions. When they give you a quote, they should have several packages for you to choose from. It should be the goal of your lighting designer to not over or under quote you. This makes it easier to work with your budget while still making your room look beautiful.